This is a very filling and delicious Greek pie - which vegetarians will also love! 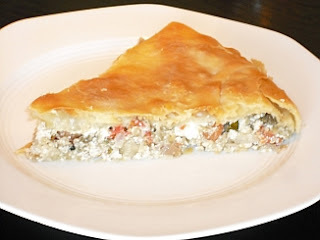 The recipe calls for Greek anthotiro cheese, but if this is unavailable where you live, then ricotta can also be used. Remove the stalks from the eggplants and pierce lightly with a fork. Place them along with the red peppers on a grill and put in a preheated oven at 250 degrees Celsius with a tray underneath to catch the liquids that will drip from them. Put the peppers at the front. Check the peppers after approx. 30 minutes and if the skin has blackened patches, then remove them and set aside to cool. Leave the eggplants in for a total of approx. 75 minutes. If the skin cracks when you tap them lightly with your fingers, then they are ready. Set them aside on a tray to cool. Once the peppers have cooled, remove the skin and seeds, roughly chop them and put in a colander to drain. Spoon out the flesh of the eggplants, put it on a tray and remove any especially hard seeds. Roughly chop the eggplant flesh, add salt and the lemon juice and put in a colander to drain for approx. 30 minutes. Put the 4 tbsp olive oil in a pan and heat the onions and garlic in it, stirring until they are golden brown. In a mixing bowl put the red peppers, eggplants, chilli, basil, crumbled anthotiro (or ricotta), tomatoes along with the onions, garlic and the oil you have fried them in. Mix lightly with your hands. With a rolling pin open out the dough with the 3 filos until you have a large circle enough to fill a round oven dish 35cm in diameter and cover the edge. Brush the oven dish with olive oil and place the circle of dough in it, covering the edge. 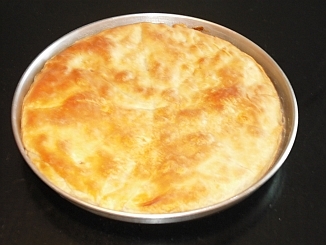 Score – without going too deep – the pie into portions (see photo at bottom). Place in a preheated oven at 180 degrees Celsius for approx. 45 – 60 minutes, until it has turned a nice golden brown.